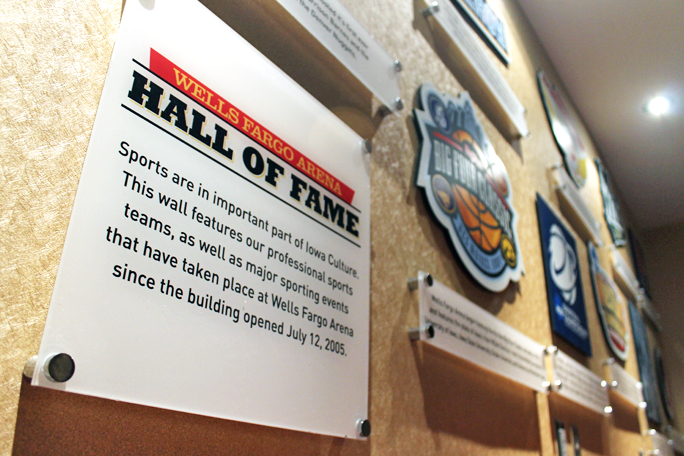 The Hall of Fame Room is located on the upper concourse of Wells Fargo Arena in Des Moines, Iowa. When I was working there full time I was asked by staff members to find a brand the room based off of performers who have visited and are in some sort of hall of fame within the music industry. I took this idea (that was limited to a budget) and ran with it, creating a room that features artists as well as high profile sporting events that have occurred at the arena in it's 10 years of existence. I then worked with a local printer to get all of the elements produced and installed. Guests can now rent this room out to enjoy an event at the arena. We will continue to add to the wall as more performers are inducted each year.